FAYETTEVILLE  The answer expressed shock to the result of the question. Who is the only Razorback both to play in and broadcast the College World Series? During his 1988-91 tenure playing right field and first base for Norm DeBriyn’s Razorbacks after playing for West Fork High School and American Legion ball at Fayetteville College Club, Brentwood’s Bubba starred for Arkansas’ 1989 Southwest Conference co-champions finishing their 51-16 season nationally fifth at the College World Series in Omaha. Last June Carpenter returned to Omaha and the College World Series. He returned as the radio color-man alongside play-by-play man Phil Elson describing Dave Van Horn’s 48-21 Razorbacks finishing national runner-up to Oregon State after they won both the Fayetteville Regional and Super Regional at Baum Stadium. The 2018 season marked Carpenter’s broadcast debut on any level. “It was a good year to start,” Carpenter said, smiling at the understatement. He became an instant hit, listeners say. If so, Carpenter says self-deprecatingly, timing with Arkansas success sure helped. Sure did, Elson surmises, but Elson asserts Bubba would be a hit regardless. Bubba has lifetime preparation to describe Razorbacks baseball. Bubba Carpenter was a three-time All-Southwest Conference outfielder at Arkansas. From the get-go the late Bill Carpenter started sons Bubba, Jay, lettering from 1988-90 for DeBriyn’s Razorbacks as a utility catcher-infielder-outfielder, Scott and Dean as Razorbacks. He recalled watching his first Razorbacks game with his dad at the old George Cole Field. Bubba was a teenaged fan when Van Horn played second base for DeBriyn’s 1982 Razorbacks. In 1988, Carpenter was a freshman and Van Horn in his last year as DeBriyn’s graduate assistant. Van Horn proved Bubba right, embarking in 1989 upon a head coaching career spanning Texarkana Junior College, a Division II national championship at Central Missouri State, Northwestern (La.) State, Nebraska and the Cornhuskers’ lone two trips to the College World. Upon DeBriyn’s retirement, Van Horn has taken the Hogs to five CWS trips. Van Horn wasn’t the only one to go places then make his mark coming home. During the summer of 1991 after completing his Razorbacks tenure that spring, Bubba began a professional playing career spanning through 2003 as property of the New York Yankees, Colorado Rockies, New York Mets and the Rockies again. All but 15 games in that tenure were in the minor leagues, but baseball on any level always is major to Bubba Carpenter. Of course he savors the 15 games he played for the Rockies in 2000. He went 6 for 31 and hit three home runs. The first was a game-winner but wasn’t the winner that Bubba remembers most. It was the phone call he made in 2000 that he wished his father could have answered last spring. Bill Carpenter passed away on Christmas Day, 2017. So Bubba savors that day in Nashville, Tenn., playing for the Triple AAA Colorado Sky Sox when the Rockies called him up. It took Bubba’s second father, DeBriyn, to recruit him to the microphone. 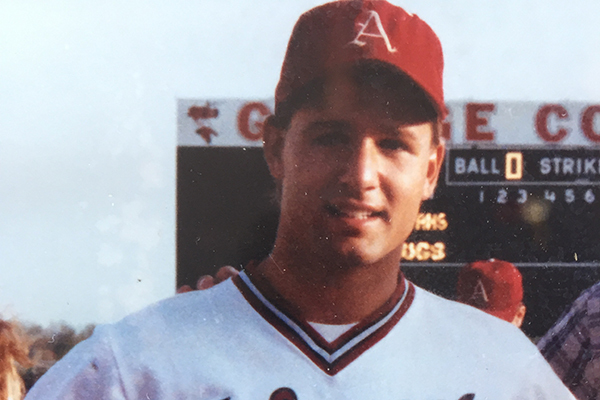 Since his playing days ended, Bubba and wife Crystal and their four children made Northwest Arkansas their permanent home. Bubba scouts some for the Yankees but mainly owns and instructs at the Next Level Baseball Academy in Springdale and coaches the academy’s associated youth teams called the Prospects. They range in ages from 7 to 18 and as prospects have included 2018 since turned pro Razorbacks Carson Shaddy and Grant Koch of Fayetteville and Kacey Murphy of Rogers. During this winter’s offseason Shaddy and fellow turned pro Razorbacks Jax Biggers and Luke Bonfield offered instruction. Bubba said it’s so satisfying when some he’s coached sign to play college ball, but says the biggest joy is seeing little boys just starting out having a ball playing ball. Bubba is a busy man, too busy to be on the Razorbacks radio he said. Then DeBriyn intervened. Norm avidly recruited Bubba for radio which Bubba said the Razorbacks’ 1970-2002 Hall of Fame coach didn’t really have to do anything to sign him as a player back in 1987. But this time after Bubba first begged off IMG’s call to do radio, he said yes to DeBryin. Like he was going to say anything else? One of his treasured College World Series highlights didn’t involve calling or playing in a a game. “We were in a rain delay and Norm came into the booth with me and Phil,” Bubba said. “We spent about 30 minutes and I got to interview Norm. Well, I don’t call him Norm. He’s still Coach D for me." As a coach, Norm brought an enthusiastically intense love of the game yet the self-deprecating kept it relative for a game means failing seven times out of 10 for a good hitter. Bubba brings that to the broadcast booth, Elson said. Well most are. Maybe it’s ego or maybe because they are prodded by producers, but it seems on network telecasts, particularly ESPN, former players babble about their playing days at the expense of the ongoing game. What Bubba may interject from personal experience stays on point, enhancing not detracting from the broadcast, Elson asserts. For Bubba, baseball, not bragging, seems to come naturally. Phil flat out expected the pairing would work upon their introductory lunch. Playing for DeBriyn gives Bubba old school respect for the game and the Hogs, but he embraces and coaches the analytics accompanying today’s game. Other than Bubba being sure to restrict his comments between pitches which only Phil initially describes, they work give and take unstructured. Their listeners and the UA apparently concur.